With springtime here and the weird mix of rain/snow/sun it brings, trails are bound to be mushy. If you're like me and have little to no balance (or little to no confidence in your ability to balance), you need something more than just boots to make hiking in March/April/May enjoyable. Enter YAKTRAX PRO, a traction device designed for these types of trails. They are so simple to put on and add the perfect amount of stability. Our first winter here in Colorado, I did a lot of research about the types of gear I would need and traction devices were the one thing that kept coming up. After lots of further research about what kind I should get, YakTrax was the only option I trusted. I got both Logan and I a pair and we promptly broke them in on a hike up Lookout Mountain. Basically, they're a rubber strap that attaches to the bottom of your boot. There are metal spirals along the bottom that grip the ground and provide you with traction. 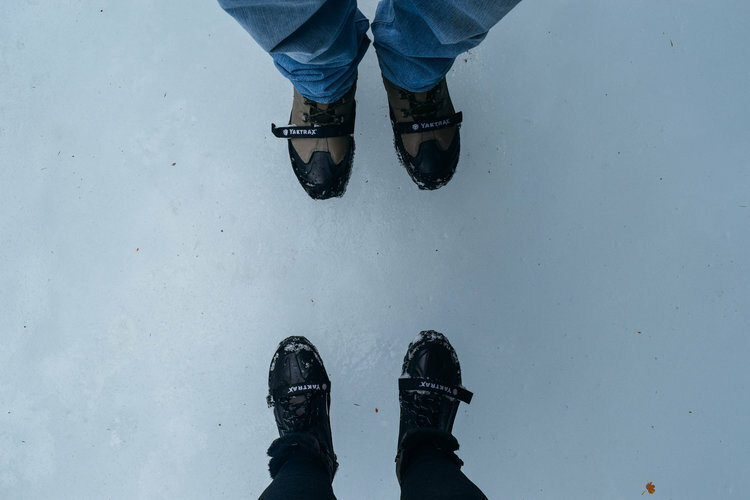 It's almost ridiculous how much these help - Logan and I were able to make it to Emerald Lake in just these the other week, while most everyone else had on snowshoes. I don't know how much of it is a placebo effect that comes from me knowing these are supposed to help, but I do know that when we hiked to Emerald Lake, it was a solid sheet of ice around Bear Lake, and as soon as we put these on I could stand up straight and walk with my arms down at my sides instead of up in the air waving around. The sizing was a bit confusing to me at first. I wear a size 9.5 shoe, so I'm used to having to get a medium or large in shoe things. The size chart, though, said I was a small and I decided to trust it. I am so glad I did - these fit over both pairs of my boots perfectly, and any bigger I would have to deal with them slipping up and no longer providing actual traction. Logan does have some issues with his slipping around, but I think that comes mostly from him putting them on backwards (they are labeled toe/heel), and less from them not working properly. This was from a hike in RMNP in JUNE - so glad I had these. I feel like YakTrax are the ultimate lifehack - it's so easy to put on and it makes such a huge difference that I don't know why more people don't use them. I also have a pair of the "run" version, and have been very happy with their performance on trail runs.